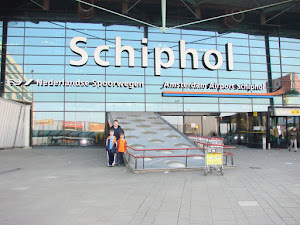 I am sorry that the report was a little short last week. I am now back to 100% health and it was heartening to receive so many well wishers’ encouraging comments. I was not able to compile a History report this week and so I was very grateful to Graham Tomlinson who stepped in at the last moment with a report and some photos. 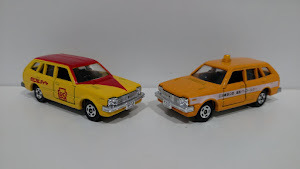 A clarification about the Matchbox Taxi (generic) shown previously in my last report is that it will be used in the City Works 5 pack and not in mainline. Another update is that Matchbox are no longer pursuing the Land Rover LR4 which had been originally moved to 2015. It will be replaced by a new licensed model. This is TBD. 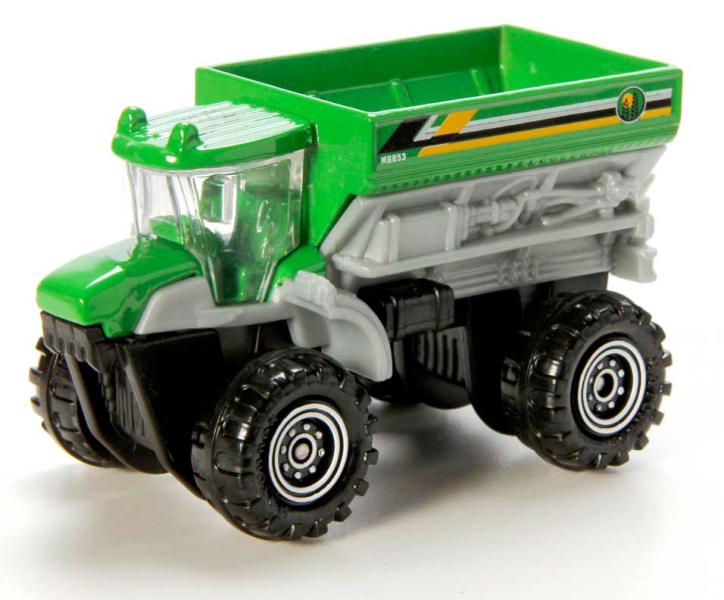 Please note that all images shown in the Ambassador Reports are provided by the kind permission of the Mattel Corporation. There is no question and answer section this week. We hope to have more answers next week. The team looks forward to receiving more of your questions. There are several new images available to show this week. First up is a new tool for 2014. It is the Snow Ripper which is a snowmobile. Next is the final exclusive car in the 9/10 packs which is the Porsche Boxster. 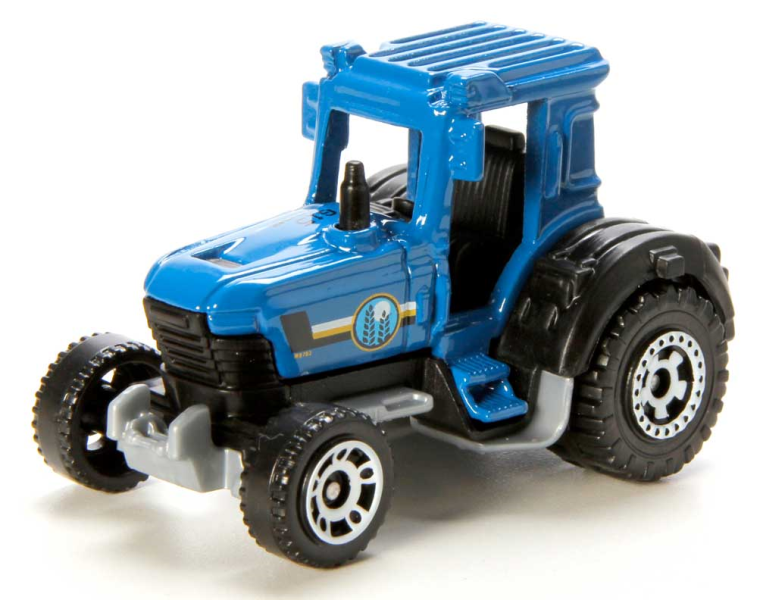 Appearing in the Mission Force Farm pack are the Tractor and the Sowing Machine. 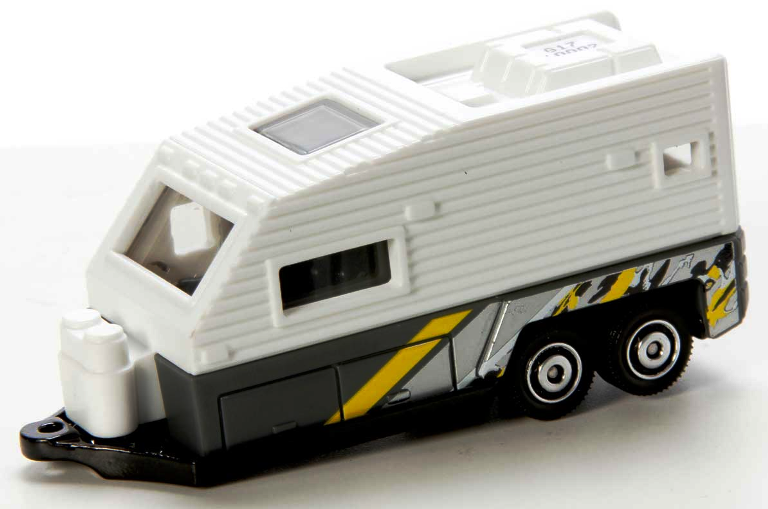 The Travel Trailer is part of the Outdoor Sights 5 Pack. 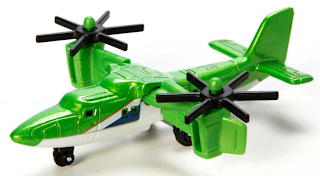 For Sky Busters we have the Tilt Rotor. 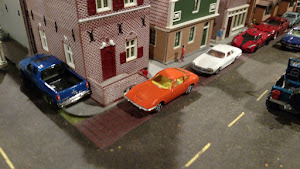 Into the Future: Lesney miniatures in 1975. 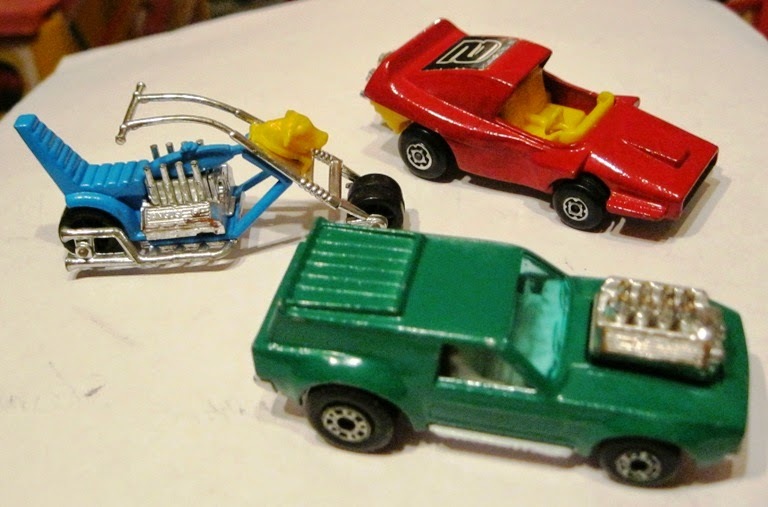 The first Superfast releases of 1969 were of realistic models such as a Lotus Europa and Rolls Royce Silver Shadow Coupe. 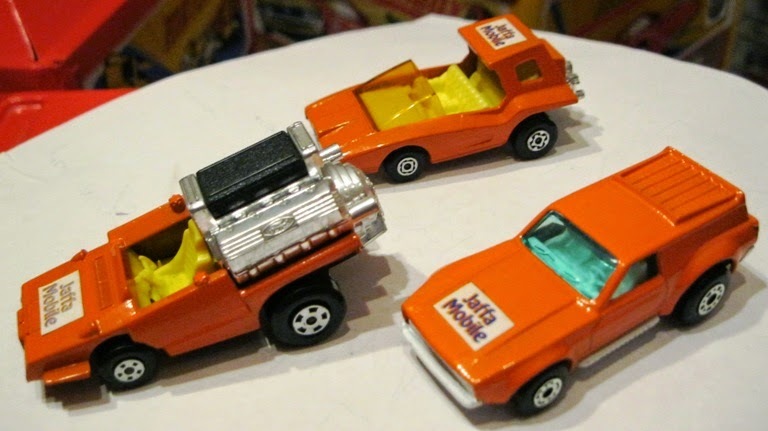 However, in 1970 the Lesney design team decided they needed to compete directly with Mattel’s Hot Wheels and started to produce some weirdly styled models such as the Road Dragster and Hot Rod Draguar. This continued into 1971 with such models as the Mod Rod, Gruesome Twosome with two engines, Hairy Hustler and Blue Shark. Such designs reached their zenith in 1972 with the outrageous Flying Bug, the Tyre Fryer with probably the biggest engine ever seen on a miniature, the Big Banger with an engine so large the driver would have been completely at a loss to see ahead of him, the angled Soopa Coopa and the curvy Woosh n Push. 1973 saw another extreme engine model namely the Pi Eyed Piper, with the driver again very likely to have an accident. 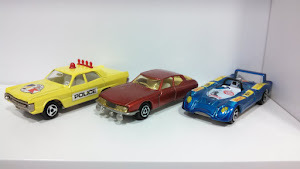 Three over the top Choppers and a whole raft of new Rolamatics models including the bizarre Clipper and several other models which had their origins on existing models, including the Hot Rocker with another large exposed engine on the Ford Capri body and the twin turbined Turbo Fury based on the Blue Shark. 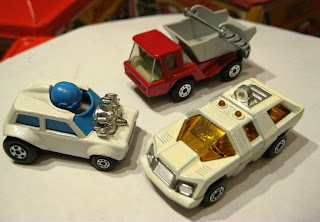 In 1974 Lesney calmed down for the nine releases for that year were far from extreme: a Mercedes, Renault, Lamborghini, Honda Motorcycle, three relatively realistic Rolamatics military models, an (admittedly generic) Articulated Truck and a Le Mans style racer. Strange then that in 1975 Lesney went all weird and futuristic again! 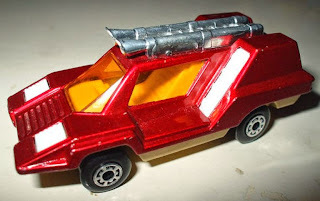 Models included a Seafire boat with huge exposed engine, a futuristic fire engine and dump truck. 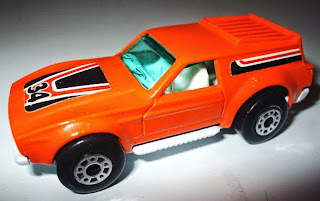 Names to become familiar in the range included Blaze Buster, Atlas, another wacky vehicle on the lines of the Flying Bug in the form of the Mini Ha Ha, and the Vantastic, yet another giant exposed engine on a heavily customised Ford Mustang! 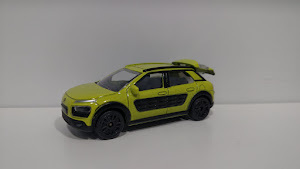 However, three further models really stand out: the futuristic Hellraiser (yes yet another outsized and exposed engine) and two very imaginative space type vehicles - the Planet Scout and Cosmobile. The Vantastic with all large dot dash wheels and, like the Hellraisers, much harder to find than Cosmobile or Planet Scout wheel variants. 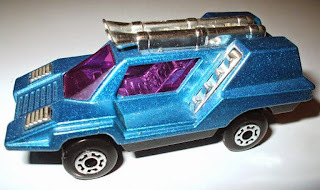 Also three models that really stand out: the futuristic Hellraiser (yes yet another outsized and outside engine) and two very imaginative space type vehicles: the Planet Scout and Cosmobile. The #5 Seafire ran in the 1-75 range until 1979, and whilst initially white with a blue hull, it was eventually produced in many colours as a result of it’s inclusion in the Two Packs range in 1980, perched on a specially designed plastic trailer. 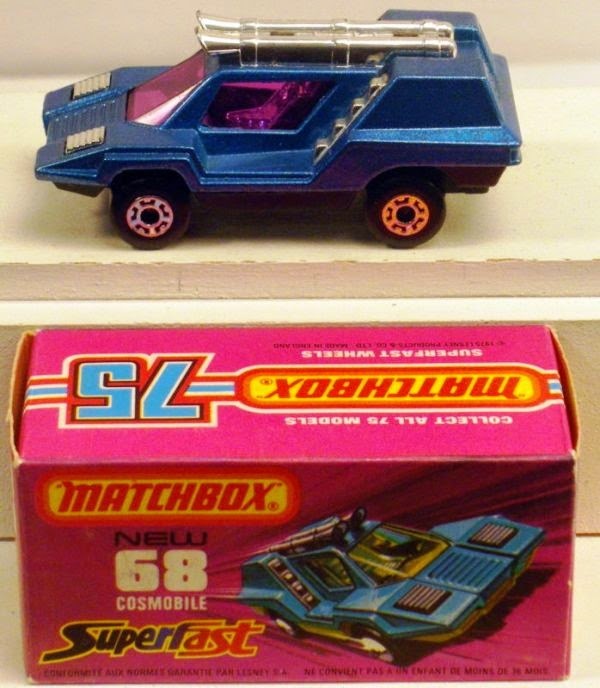 In this form, and in 5 packs, it continued to be produced into the 1990’s. Rare examples include that in white with a brown hull, and perhaps the hardest to locate, red with a blue hull. 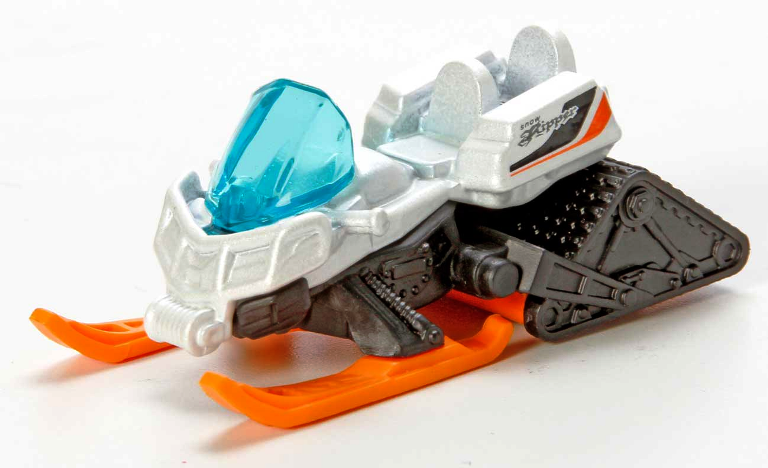 The #22 Blaze Buster had a white ladder in pre-production. It is a contentious issue as to whether this was also the first production model, or simply that a few pre-pros escaped the factory. If one exists on a sealed card it would help to clarify this uncertainty. 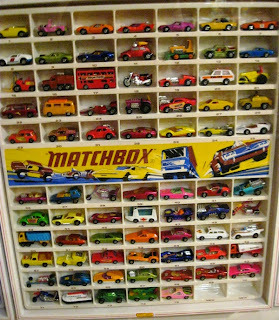 It is generally found with a yellow ladder, though the contention from the book “Matchbox: The First 40 Years” that this was because white nylon material was not normally used at the Lesney factory in 1975 is arguably not true because the interiors of the Piston Popper and Londoner Bus may challenge this assertion. Certainly yellow did nothing to add realism to the model, though the limited run with a black ladder is far more attractive. 5 spoke wheels were always fitted to this model, though some rare examples exist with the 4 spoke wheel most often found on the Hot Rod Jeep or Lotus Super Seven. This variant commands a substantial premium. 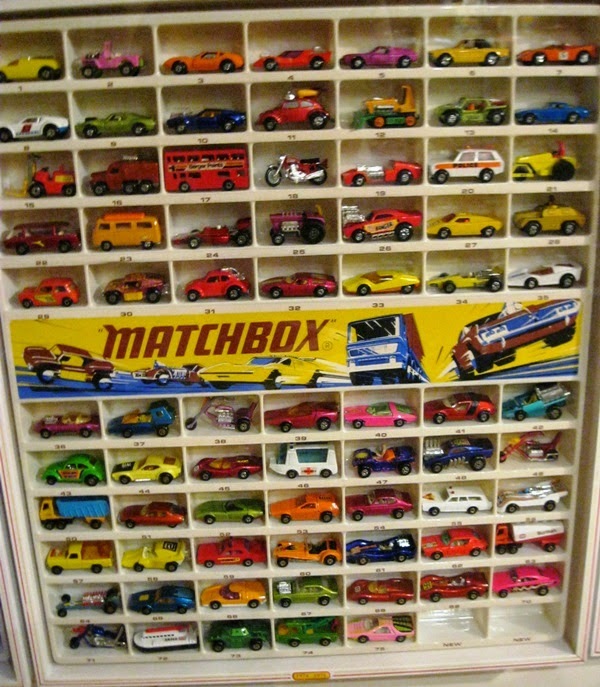 The model always had “Fire” labels to each side, except for the “No.32” labels used on gift set models. Such examples used to be considered rare and desirable but now fail to produce much interest. 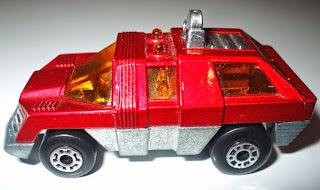 Considering how long it remained in the range it seems strange that the Blaze Buster was never converted to include the 5 arch style wheel introduced shortly after the initial release. Bulgarian versions of this model come exclusively with the 5 arch style wheel. Bulgarian models can also be found with a white ladder. One funny quirk occurred in the 1983 catalogue, when the 1984 new release #18 Fire Engine was accidentally pictured in the #22 Blaze Buster slot! 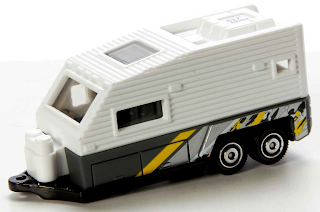 The Blaze Buster started life with an unpainted base and chrome interior, but by the final run in 1984 it had for some time sported a black painted base and, ironically, a white interior, yet still maintaining the yellow ladder! The #23 Atlas was initially released with spiro type wheels as found on the Beach and Baja Buggys, but these were soon changed to the dot dash style. The first run also included a striped label running down each side of the dump, but after just a few months this was discontinued, leaving the model looking rather dull in dark blue with an insipid orange dump, especially after the amber windows and chrome interior were changed to clear glass with a dull grey interior. However the Atlas was enlivened in 1981 when it was re-coloured orange-red with a silver dump which was a much more attractive look. Rare examples abound: dark blue with cross-over silver dump, orange-red with a black interior, and dark blue with either orange or silver dump, both with a yellow interior, the latter being perhaps the rarest combination. 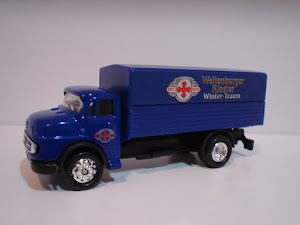 The body of this model was also used on the #37 Skip Truck released in 1976. The Atlas was deleted during 1983. The #14 Mini Ha Ha was a curious release in 1975 as it was clearly more suited to the early ‘70s era, but has always been a popular model. 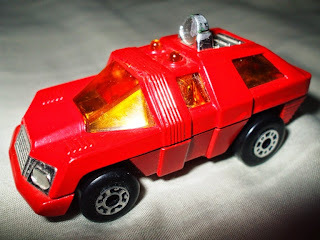 Released in red with a bank of four giant exhaust pipes, blue windows, a huge WW1 style aeroplane engine and pilot to match, this model continued in the range into 1982 without ever being altered. The only variants are those with two colour rather than four colour bullseye labels on the doors, and dot dash front wheels rather than maltese. It is perhaps a pity that Lesney never saw fit to re-colour this model at any stage, as Brazilian models in blue, orange and green amongst others indicate how superb it would have looked: a missed opportunity. The Vantastic was almost unrecognisable as a ’72 Ford Mustang due to it having been turned into an estate shaped van with a massive engine at the front! Released in bright orange with blue windows, labels to the sides and a white painted base, it was an attractive piece. The 1975 trade catalogue shows it at #14 and pre-production examples have this number on the base, however it was eventually decided to designate it #34 instead. 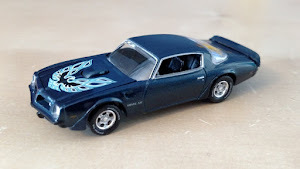 By early 1978 almost all the Hot Wheels styled models from the early ‘70s had been deleted and it was decided to remove the engine altogether: a”34” label was stuck in it’s place. 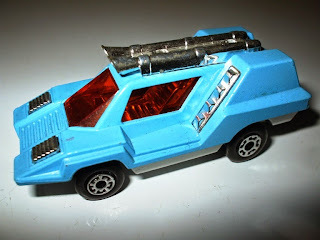 The design of the side labels was slightly altered, although sometimes these were now missing altogether, and occasionally a “Sunburst” label from the #47 Beach Hopper was found on the bonnet instead. 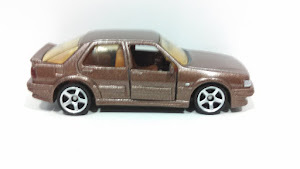 Rare examples include those with the engine and unpainted base, and with a “Jaffa Mobile” label on the bonnet. This is another model which is somewhat contentious. 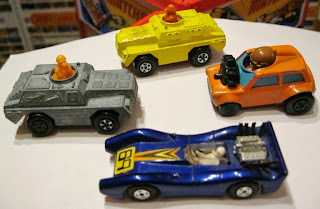 McVities made a very large order of multiple thousands of the original Jaffa Mobile in 1976, the #37 Soopa Coopa in orange. Due to the huge public demand for this model, offered on packets of McVities Jaffa Cakes, more models were ordered in 1977. However the Soopa Coopa had just been deleted, so the #42 Tyre Fryer was substituted, and again many thousands were produced in orange. Whilst both are considered rare and command high prices when mint, in fact both these models are quite easy to obtain, due to the vast quantities made and distributed. 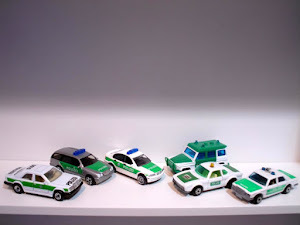 It seems to make no sense therefore that examples of the Vantastic with Jaffa Mobile labels are extremely scarce, and those very few that do materialise could allegedly be fakes. McVities would surely not have ordered just a few dozen pieces, even if Lesney had permitted such a small order which in itself is highly unlikely and therefore whilst some Vantastics do exist with genuine Jaffa Mobile labels, it is most possible that these were made privately during or shortly after 1982 when most Lesney factories ceased production and released spare labels. 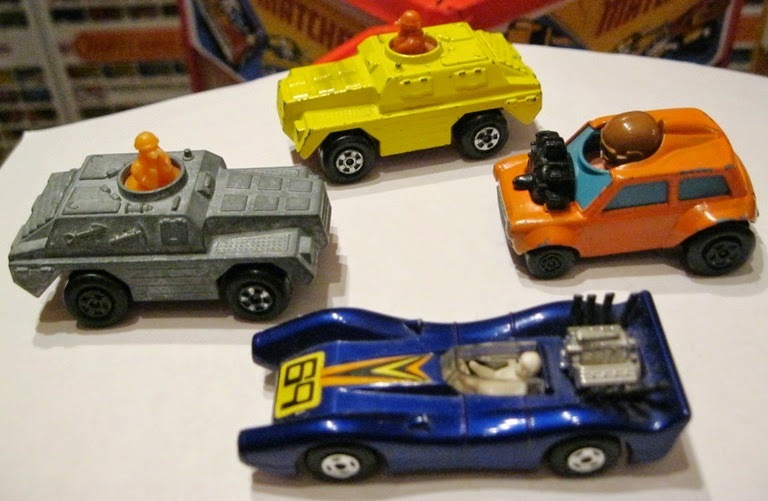 All Vantastic models came with 5 arch front wheels and dot dash rear, and although variants do exist, they are very hard to come by. 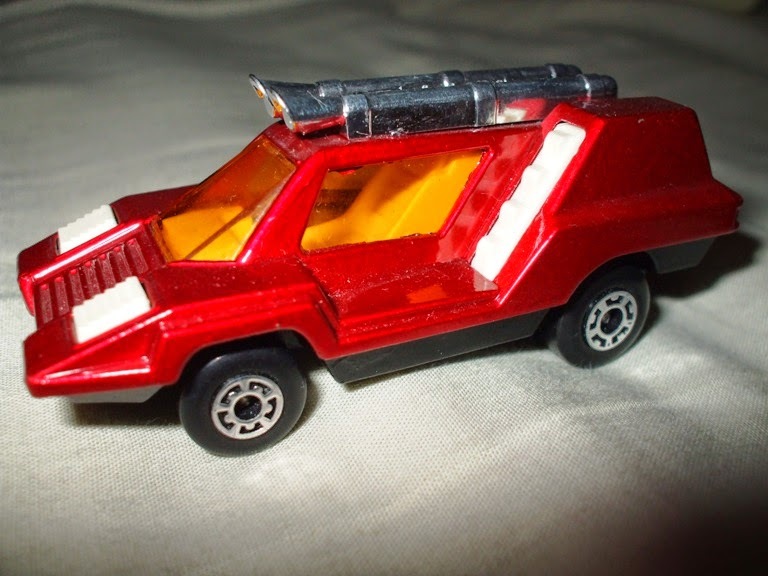 The Vantastic was deleted in 1981. The #55 Hellraiser was yet another model sporting a huge exposed engine, though on this particular model at the rear. Initially available in white with a red interior, in 1977 it was changed to a rich blue colour with an off white interior. 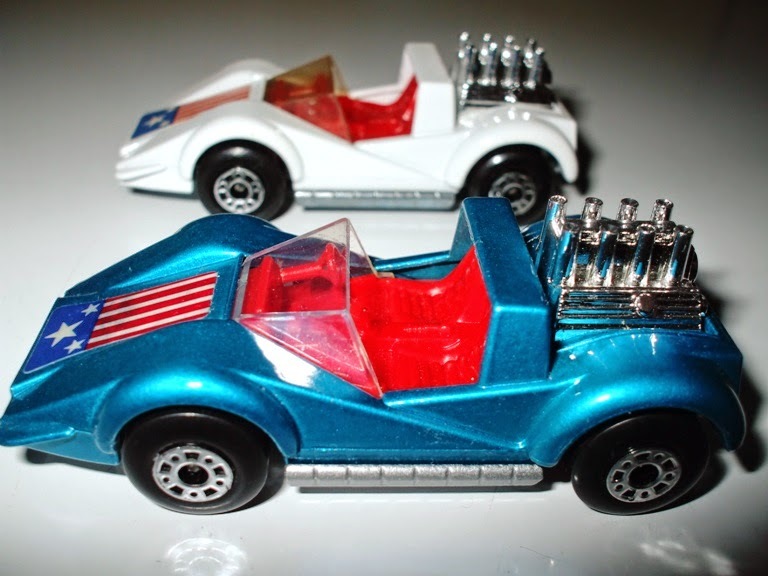 The blue example can be found with the red interior from the white model but only commands a small premium. 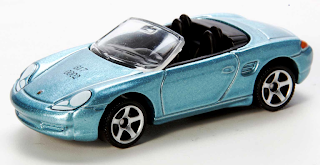 All blue models with red interiors, and roughly half those with the off-white interior, have silver painted bases. All variants included a “stars and stripes” label at the front, though some blue examples with off white interiors and silver bases can be found with the “3” label from the #3 Monteverdi Hai. Again this variant, though not common, creates only mild interest. As with the Vantastic, wheel variants on this model exist but are very few and far between. 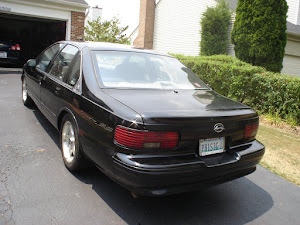 As standard it was released with 5 crown front and dot dash rear wheels. 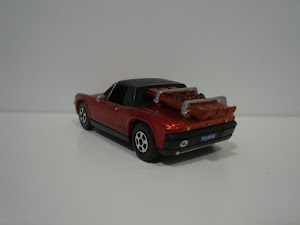 Rather than remove the engine from this model, Lesney chose to delete it from the range in 1979. Very rare Hellraiser wheel variants: both have large dot dash front and rear, note blue model has the rarer red interior cross-over. The #59 Planet Scout was released as a space oriented vehicle, as was the #68 Cosmobile, the names rather give this away! 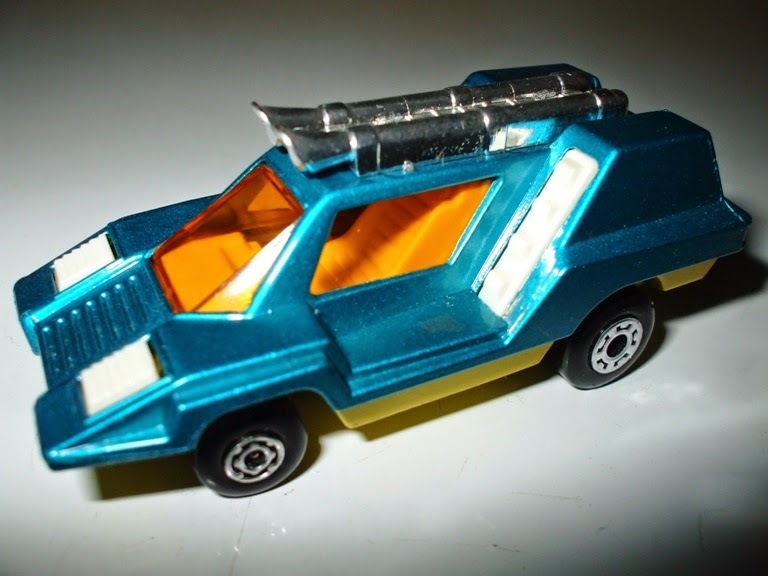 The Planet Scout was released in two tone green, with the Cosmobile in blue and yellow. 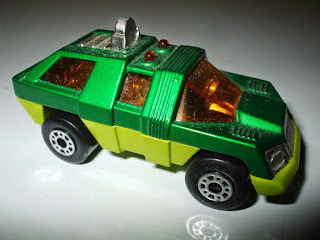 The Planet Scout can be found with the base in lime green or less common apple green, though this is not considered rare. Both came with amber windows and chrome interiors, and although the Cosmobile was later altered to include a white interior, the roof horns were always chrome. 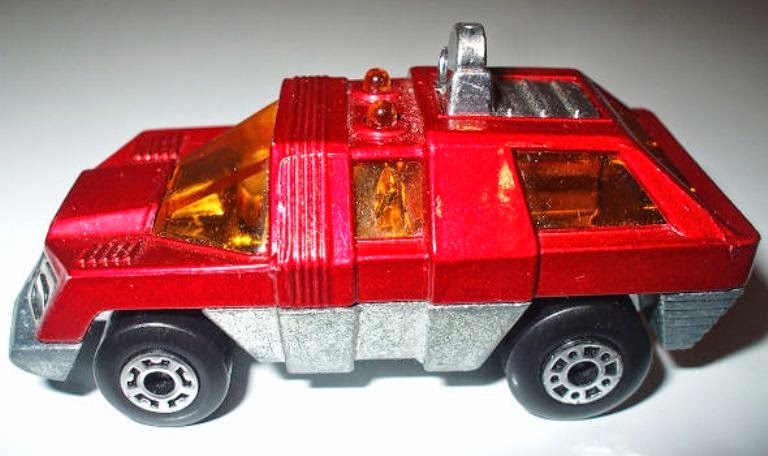 In late 1978 both models were changed so that they now had a matching colour scheme of metallic deep red and beige. Although plentiful, for some reason this colour combination is considered rarer and commands a small premium. 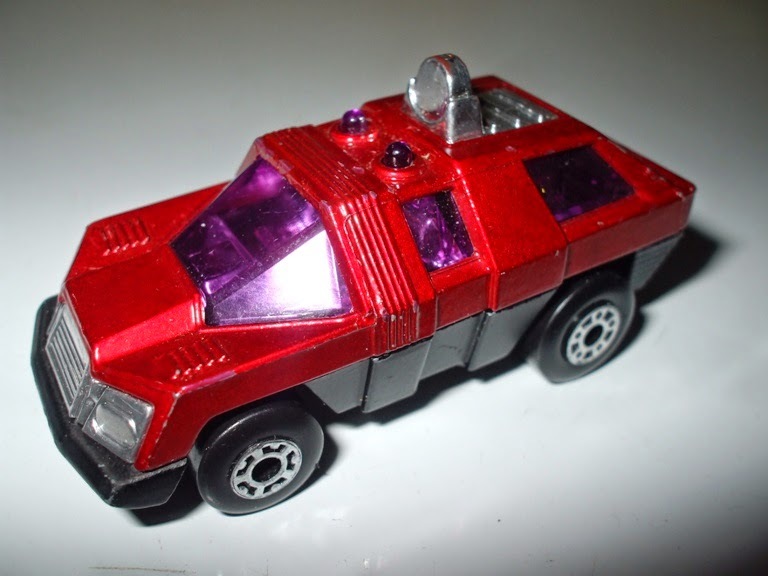 A small run of red Cosmobiles were made with chrome interiors and they are quite hard to find yet strangely are not considered rare. Rare cross-over Cosmobile, standard metallic red upper with matt black Adventure 2000 base! The following year, 1979, the Adventure 2000 range was expanded to include the K-2005 “Command Force”. 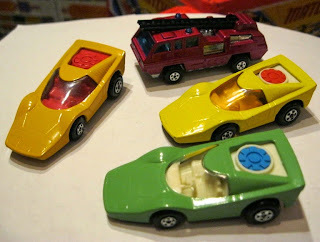 This set included three miniature models, including both the Planet Scout and Cosmobile. The colour scheme chosen was avocado and matt black, and the windows were changed from amber to purple. 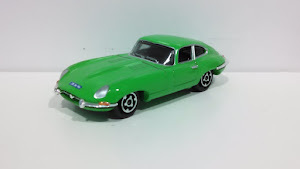 Although at the time not very successful in this colour scheme, these models are now quite sought after. The avocado Cosmobile can be found with chrome or white interiors, but far rarer are those with amber windows, which again can be found with both colour interiors. The Cosmobile in avocado with amber windows with either interior commands a huge premium, and can sell for around £200 as it is rarely seen. The amber window Planet Scout in avocado is less rare but still fetches in excess of £50. 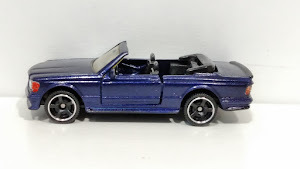 Due to the poor sales of these sets in this colour, in 1980 the colour was changed to a metallic dark blue, though the base remained matt black. This colour scheme is shown both in the 1980 and 1981 catalogues, yet despite this none of the sets were ever released. Single examples of the metallic blue models did however appear in Tescos stores in 1981 on blister cards, or in Tesco multi packs. 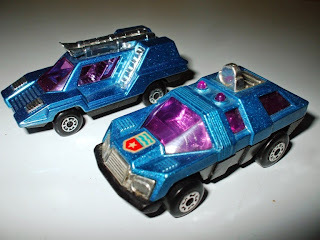 These blue models only ever came with purple windows, and the Cosmobile only with a chrome interior, and examples of both now make in excess of £100 each, sometimes twice as much. Unlike the #34 and #55, wheel variations on both these models are, relatively speaking, quite common, but as they are still rare they create a good deal of interest. The Planet Scout should come with 5 crown front and dot dash rear wheels, but can be found with 5 crown front and rear or dot dash front and rear on most colour schemes. 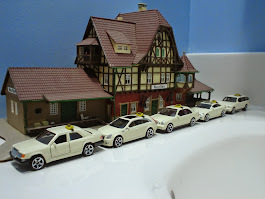 The Cosmobile should have 5 arch front wheels and 5 crown rear, though again it can be found with all 5 arch or all 5 crown, possibly on all variants. Another rare wheel variant is the blue and yellow model with a white interior, where an extremely small run were made with small maltese front wheels! 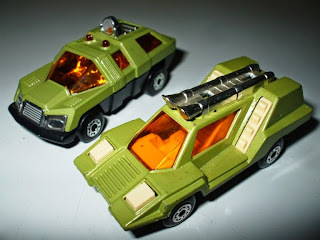 In the miniatures range the Cosmobile was deleted in 1979 and the Planet Scout in 1980, although the Planet Scout was later made in a plethora of different colour schemes, often with highly inappropriate tampo print, in Bulgaria. The last two Rolamatics models were also released in 1975, the #20 Police Patrol and the #35 Fandango, the latter another example of Lesney weird and wonderful styling. 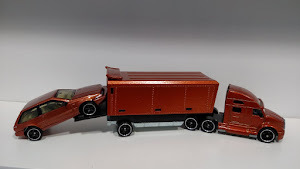 From 1976 onwards Lesney started the trend back to realism, and so 1975 was the last year of Lesney breaking the boundaries of mad imagination, but often highly successfully and with, dare I say, beautifully designed models! Some pre-pros linked to this article are shown below.